Scientists planning the the next phase of NASA’s New Horizons mission, a robotic craft that completed the first exploration of Pluto in 2015, are going into the flyby of a frozen, faraway city-sized clump of rock on New Year’s Day 2019 armed with little knowledge of the target lurking around 4 billion miles (6.4 billion kilometres) from Earth. Some of the object’s profile will be filled in by the time New Horizons reaches it, but mission managers expect many surprises as the spacecraft zips past 2014 MU69 — the target’s official name — at a relative velocity of more than 9 miles per second (about 14 kilometres per second). The little world will become the most distant object ever visited by a spacecraft. Scientists are not sure of the object’s exact size — it might be anywhere from 13 miles (21 kilometres) to 25 miles (40 kilometres) across, Grundy said — or its shape, spin rate, color, or whether 2014 MU69 has any moons or rings. 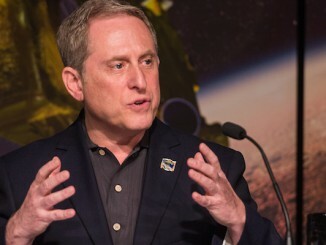 Alan Stern, the New Horizon mission’s principal investigator, said miniature worlds like 2014 MU69 are likely the leftover ice and rock fragments that formed larger objects like Pluto, the moons of some Uranus and Neptune, and other dwarf planets in the outer solar system. “The small Kuiper Belt objects like (2014) MU69 that we’re going to be flying out to in 2019 are thought to be the building blocks of the small planets in the Kuiper Belt, like Pluto and the others,” Stern said in a Facebook Live event Jan. 19 highlighting the progress of the New Horizons mission. New Horizons launched 11 years ago, on Jan. 19, 2006, flew by Jupiter for a speed boost in February 2007, and executed the first-ever close-up encounter with Pluto on July 14, 2015. The spacecraft’s instruments, including a telescopic camera, a color imager, and composition-measuring spectrometers, found Pluto an unexpectedly exotic world with frozen nitrogen glaciers, a tenuous hazy atmosphere, and evidence of a possible liquid ocean and ice volcanoes. “One thing that we disecovered is that small planets can be just as complex as big planet, and that really blew away our expectations,” Stern said Jan. 19. “We did not think that a planet the size of North America could be as complex as Mars or as the Earth, and yet that’s what we found. Scientists always hoped to keep New Horizons going after its historic Pluto flyby, but they found no suitable targets for the mission’s second act until a special search with Hubble in 2014 discovered two potential objects within reach of the spacecraft’s limited fuel supply. 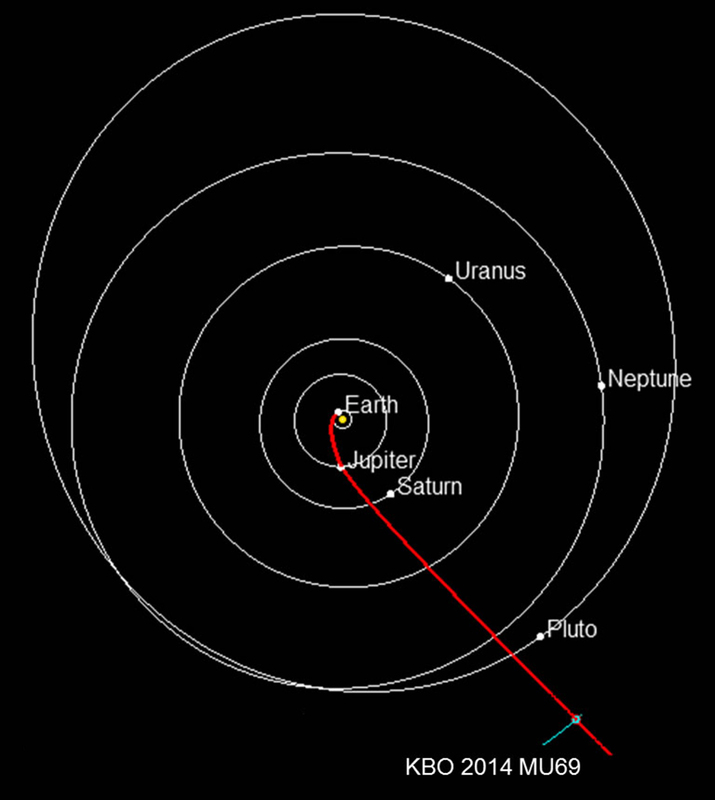 In August 2015, a month-and-a-half after New Horizons zipped by Pluto, officials selected 2014 MU69 as the favoured destination for the probe’s extended mission. NASA formally approved the plan last year. Earlier this month, Grundy told NASA’s Small Bodies Advisory Group, a forum for researchers focused on asteroids, comets and related solar system objects, that ground controllers are beginning to erase the data recorders on the New Horizons spacecraft after the robot finished downlinking the last of the data it collected at Pluto. It’s a careful process because managers want to ensure nothing gets inadvertently deleted from the spacecraft’s memory drives. Scientists know the approximate size and orbital trajectory of the distant object now in New Horizons’s sights, but little more. Astronomers have studied 2014 MU69 for less than three years, leaving many questions about the distant destination unanswered. One piece of data sought by New Horizons scientists is the exact location and motion of the target. That will be aided by repeated observations by Hubble and the European Space Agency’s Gaia observatory, which is surveying the entire sky to pinpoint the positions and movements of more than a billion stars, asteroids and other objects. Planning for the complicated sequence of picture-taking, composition scans and other observations scientists want New Horizons to capture at 2014 MU69 is already underway. It took four years to develop the fine pointing commands, instrument activations, and fail-safe computer logic needed for the spacecraft’s high-speed visit to Pluto. For the Jan. 1, 2019, encounter with 2014 MU69, scientists and engineers have 18 months to finalize their plans. Stern and Grundy said the ground team is working on two flyby scenarios for 2014 MU69. One of the flight plans would likely have New Horizons fly within 1,900 miles (3,000 kilometres) of the object, a range that would allow the spacecraft’s main camera to see features as small as buildings, Singer said. Officials have not picked a precise distance for the encounter. That will depend on updated orbit and motion data from Hubble and Gaia. Similar to the backup plan developed leading up to the Pluto flyby, Stern said the ground team will work on a bailout option for New Horizons in case the craft’s cameras spot rings, moons or debris surrounding 2014 MU69 in the weeks before closest approach. In such a case, New Horizons could be steered on a path slightly farther from the object to ensure it does not collide with dust or ice. Such debris strikes could be fatal to the spacecraft at the projected flyby velocity. By mid-year, scientists hope to nail down an estimate for the target’s rotation rate by analysing Hubble data, but much of the flyby sequence will need to be designed before planners can incorporate that knowledge, Grundy said. Astronomers also plan to watch 2014 MU69 pass in front of a star later this year. The dimming of the background star, called a stellar occultation, could tell scientists more about the object’s size and shape, and possibly reveal dust clouds, rings, or moons accompanying it. But the object’s modest size mean the occultation will only be visible from a narrow band of territory. A network of astronomers around the world and NASA’s airborne infrared observatory, known as SOFIA, will try to catch the act. “This is going to be very challenging, but valuable,” Grundy said of the Earth-based observing campaign. Meanwhile, engineers at New Horizons’s mission control are fine-tuning the probe’s trajectory with a series of course correction maneuvers by the craft’s rocket thrusters. 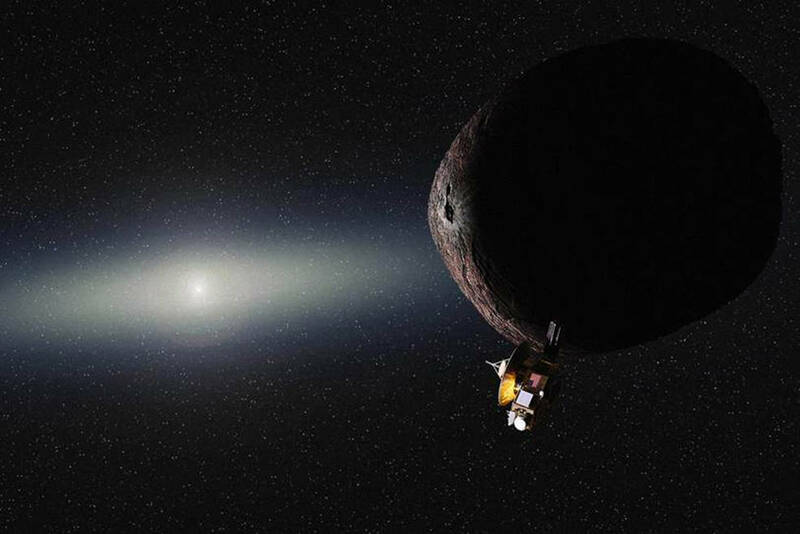 “As we learn more about the orbit of (2014) MU69 and know exactly where we need to head, we’ll execute some more of these maneuvers, possibly as many as 10,” said Helene Winters, New Horizons project manager at the Johns Hopkins University Applied Physics Laboratory in Laurel, Maryland. Four rocket burns in late 2015 did most of the retargeting, but engineers believe more are needed, beginning with a maneuver scheduled for Feb. 1, Winters said in the Facebook Live event last week. The science team also intends to take pictures of up to two dozen other known Kuiper Belt objects over the next year-and-a-half. The spacecraft will not get close to those bodies — they will be millions of miles away — but New Horizons will be much closer to them than any telescope. 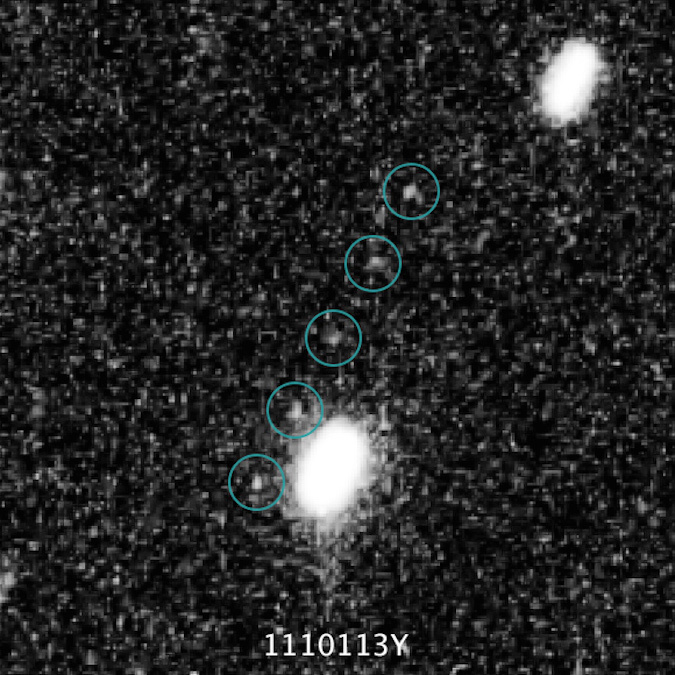 “This is the first time we’ve had essentially an astronomical observatory in the Kuiper Belt looking at objects that are too faint to study in this way from the Earth,” said Stern, a scientist based at SWRI. Measurements of the solar wind and plasma environment in the outer solar system are also on the mission’s docket. NASA has committed to fund the New Horizons mission through 2021, when all the data gathered from the January 2019 flyby should be back on the ground. It will take even longer to downlink science data from New Horizons after the visit to 2014 MU69 than the 15 months needed to return all the observations of Pluto. At the vast distance to the mission’s next destination, it will take more than 12 hours for radio signals to travel the round-trip between the spaceraft and Earth, and the transmission rate will slow to a crawl. New Horizons could be granted another mission extension after 2021 to continue monitoring its surroundings as it escapes the solar system, following in the footsteps of the trailblazing Voyager probes. The craft draws on the heat from a plutonium power source for electricity. “The spacecraft is about 400 million miles (643 million kilometres) beyond Pluto and some 3.5 billion miles (5.6 billion kilometres) from Earth, and it’s doing just fine,” said Glen Fountain, former project manager for New Horizons, during the Facebook Live event. “All the systems aboard are working. We have plenty of power to continue the mission out though the Kuiper Belt flyby we’ll do later, and further beyond that. “The power decreases as we get further away in time because the plutonium on-board has about an 80-year half-life, so it’s slowly losing power, but we can still run until about the mid-2030s,” Fountain said. When Pluto was reclassified as a dwarf planet in 2006, Neptune regained the title of the solar system’s outermost planet. Since this fascinating gas giant reached opposition on 1 September in the constellation Aquarius, now is a great time to seek it out. 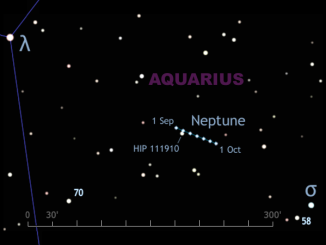 We show you how to locate Neptune with binoculars and small telescopes. 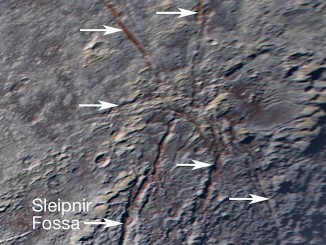 Sprawling across Pluto’s icy landscape is an unusual geological feature that resembles a giant spider. This enhanced colour image, obtained by NASA’s New Horizons spacecraft on 14 July 2015, consists of at least six extensional fractures (arrowed) converging to a point near the centre. 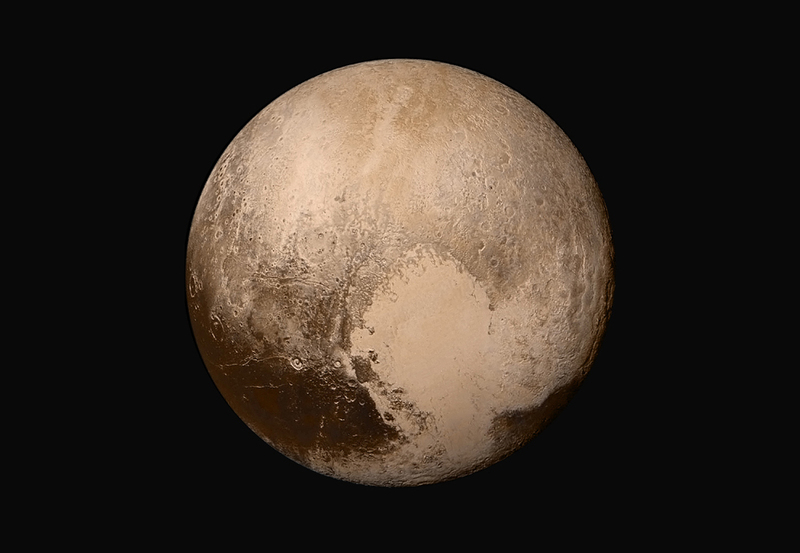 Curiously, the spider’s “legs” expose red deposits below Pluto’s surface.